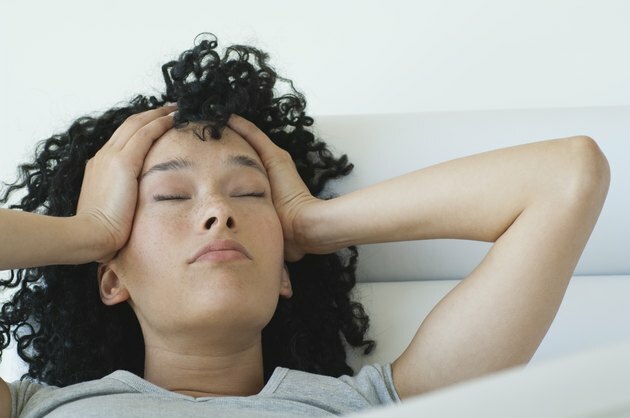 Can You Prevent a Hangover With Vitamin B Complex? Having just one more drink generally seems like a good idea at the time, but overindulging can make you seriously question your judgment come morning. Headache, nausea, fatigue and a nasty case of cotton mouth can make even the heartiest partier swear off the sauce ... at least until the next time. Aside from not drinking at all, your best choice is to indulge responsibly — but it is also possible to engage in some effective damage control the morning after if your better judgment fails you. Alcohol both interferes with the absorption of B vitamins and depletes them from your system, so taking B vitamins before drinking will not help you avoid a hangover. Hangovers are the result of several effects of alcohol on your body, according to the experts at Stanford University. Alcohol is a diuretic, so drinking too much results in dehydration. This shrinks the dura, which is the membrane surrounding your brain, causing your headache. Alcohol also depletes the B vitamins in your system, which leads to fatigue. It can irritate your stomach and intestines, which contributes to nausea, vomiting and/or diarrhea, according to the University of Texas at Austin. Read More: Why Do You Get a Headache After Drinking Alcohol? Taking vitamin B-12 before drinking alcohol will not have any effect on whether or not you can avoid a hangover, according to The House of Wellness Pharmacist and Master Herbalist Gerald Quigley. Alcohol inhibits your body's ability to absorb B vitamins and also leaches B vitamins from your system, so taking a large dose before drinking does not help stave off a hangover. That said, there actually are several steps you can take to ease the effects of drinking. Make sure you eat before a night of drinking. A meal built around carbohydrates such as whole grains, pasta or bread is a good idea, because carbs help slow the absorption of alcohol. Adding fruit can help hydrate you. Your body can process approximately one drink per hour, so take it slow when you're imbibing. Alternate between alcoholic beverages and either water or soft drinks to help avoid becoming intoxicated. Stick with clear alcohols such as gin, vodka, white rum or white wine. All alcohol contains conengers, which are impurities created during the fermentation process. Conengers are known to aggravate hangover symptoms, and they're present in higher concentrations in darker booze such as whiskey, scotch and red wine. Read More: How Many Beers Can You Drink Without Getting a Hangover? While there are many supposed miracle cures on the market, no B-12 hangover cure has been proven to work, and that includes B-12 shots. Replenishing your lost B vitamins by taking a B complex the morning after may ease some of the symptoms, but according to Columbia University's advice column Go Ask Alice! the only real hangover cure is time. However, there are things you can do to ease the symptoms. Drink plenty of water, advise the fitness experts at Shape. Sports drinks can also help, as can ginger tea or clear soup. Eating carbohydrates such as crackers, bread or pasta can help bring your blood sugar levels up without upsetting your stomach. Light exercise combined with aggressive hydration can also help speed your recovery time along, so take a good, long walk — and maybe reflect on how to do a little better next time. Columbia University - Go Ask Alice! : Hangover-Helping Product? The House of Wellness: Can Vitamin B Help Ease a Hangover? Does Drinking Beer Fix a Hangover?